This post is by Alice Lee, a student at the University of Pennsylvania, PA who helped to plan and organize this year’s PennApps Student Hackathon. The fourth biannual PennApps hackathon took place in Penn’s engineering quad, where over 180 students and 22 sponsors hacked for 48 hours straight. Simple is hard to make. That seems kind of counter-intuitive, but if you think about it, creating anything that appears uncluttered and effortless requires, in fact, a lot of effort. 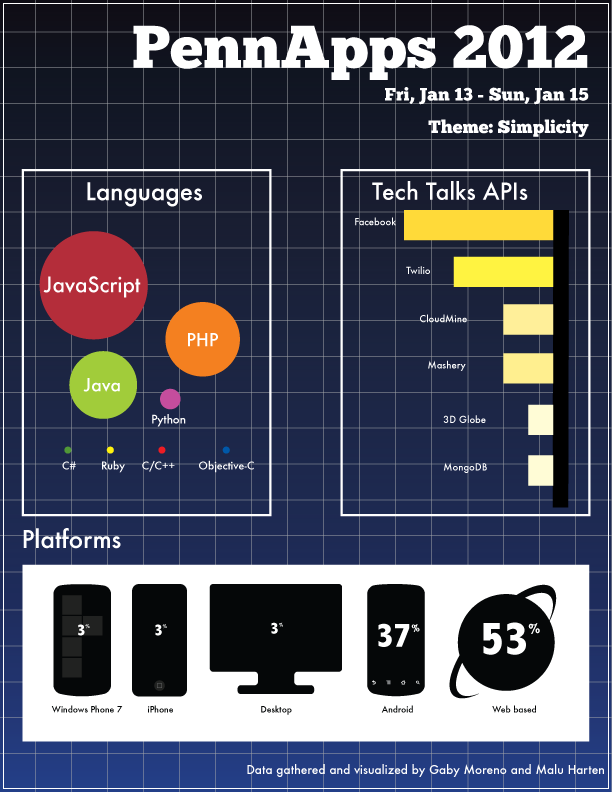 And with Simplicity as the official theme of this weekend’s PennApps hackathon at the University of Pennsylvania, student hackers had their work cut out for them – but as usual, didn’t disappoint (talk about skill – check out an infographic of all the technologies used by students during the hackathon). Over the course of 48 hours (and hundreds of caffeinated energy drinks), we saw 180 students from three* different schools and reps from 22 corporate sponsors work together to hack up 40 apps by the end of the weekend. ScratchTable, the hackathon’s grand prize winner, is a hardware hack that is so simple that it’s almost magical. The premise is straightforward enough, although I’m sure the execution was anything but. By using a sensor that monitors the vibrations of the surface it’s on, you can turn any object into an interactive set of controls. That means a chalkboard = a DJ scratchtable, a desk = a set of buttons that you can press, and the list goes on. A bunch of the apps also carried a political theme throughout – fitting, as the House vote on SOPA is coming up next weeks. Grassroutes lets website owners make simple widgets featuring local representatives’ contact info – and then uses Twilio to allow users to directly call those reps from the widget itself. And finally, as the winner of the “Most Ingenuous” award for creativity, Giftful gives users meaningful present recommendations for your friends – based on the likes on their Facebook profile page. If I hadn’t been an actual participant, I would have thought that the products that came out of this weekend were made by professional, full-time developers. Check out all of the hacks here – and prepare to be blown away. View all posts by HackCollege.